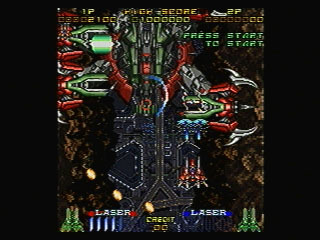 Anyway, Galactic Attack comes very close, just because it's an overhead shooter. So you can see the trees, the rivers, and the lakes from above, like in Xevious. Well, not quite, because only stage 3 looks like Xevious. The rest of the stages take place in space, over a city, over what looks like a highway, and so on. So you get nice variety between stages. The graphics are acceptable. I say "acceptable" because on several occasions the sprites are pixelated (and I hate pixelization). This happens when some mid-level bosses appear from above and during most of stage 4. Honestly, they could've just drawn the highway at a higher resolution and then scale it down at the end of the stage. It would've looked better than scaling it up, only to scale it down at the end (what they ended up doing). Other than this defect, the game looks very nice, and features several layers of parallax, especially at the end of stage 4 and on stage 5. On stage 4 you reach what looks a canyon, and as you move, you see several layers of brown stone at the sides of the screen. On stage 5, as you travel over a city, you see the lights at the bottom and also the top of the buildings, which are made of several layers, like a wedding cake. Honestly, words or screenshots cannot do it justice. You have to see it in motion. The backgrounds tend to be very colorful, too. You see beautiful galaxies, floating islands, firewalls, moving clouds, and more. The firing system is arguably the most innovative part of the game. 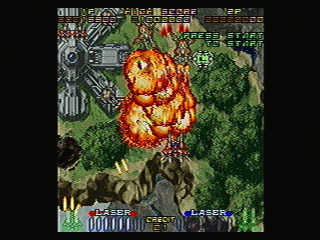 Xevious, the game I worship so much, actually makes it harder to shoot the enemies which are below you. You have to position the cursor exactly above the enemy and then press the correct button. You also have to make sure that the weapon has "recharged," which takes about a second. Galactic Attack is much simpler. 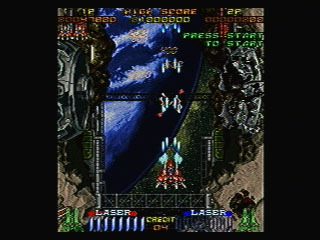 Remember After Burner? It's very simmilar here. As your cursor overlaps an enemy below you, it automatically "locks." You just press a button to launch the missiles. Of course, it's better if you "lock" as many enemies as possible (about six, although it depends on how powerful your weapons are) before you press the button. You get more points that way, plus it looks cooler. Of course, this strategy does not work when you face an enemy present on the foreground. You have to press the "fire" button just like on any other shooter. The convenience of the "lock" system comes at a price, though. There are no bombs. On a few occasions I could've taken advantage of a bomb or two. The enemy design is cool, for the most part. You deal with the usual spaceships, tanks, and robots. I don't like all the bosses, though. They all get the job done, and take a while to destroy. I can't end this review without mentioning that the stages of this game have very original names. Names like "Red Power to Pierce Through," "The Gravity of Blue Side," and "The Fissure of Consciousness." 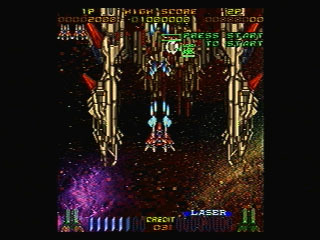 As a matter of fact, this game was called in Japan "Layer Section," which is much better than the trite "Galactic Attack." In summary, this is a very enjoyable shooter. I enjoyed it more than any other 2D shooter that came to the U.S. Of course, that's not saying much. The best 2D shooters for the Saturn stayed in Japan.